The relatively wide range of the available text, of about 4700 signs, gives us an opportunity to identify the forms of the signs which are the basis of the script used. The most frequent ones are denoted asymmetrical, symmetrical and inclined (slanting) signs. The main characteristics of the script and the initially identified signs are presented in details in our previous works, , . If the basic assumption is that the analyzed text is written in the language of the ancient Macedonians, the determination of the sound characteristics of that language will be realized through the sound features of the domestic population in the Balkan area, as their parent territory. We assume that the sound values of the consonants and vowels, as mostly not liable to changes, have retained the same pronunciation up to the present day. The wiring for sound of the identified syllabic signs can be realized by finding words in the text which have preserved their meaning to the present day in languages or dialects in the Balkan area or farther afield in the European area. 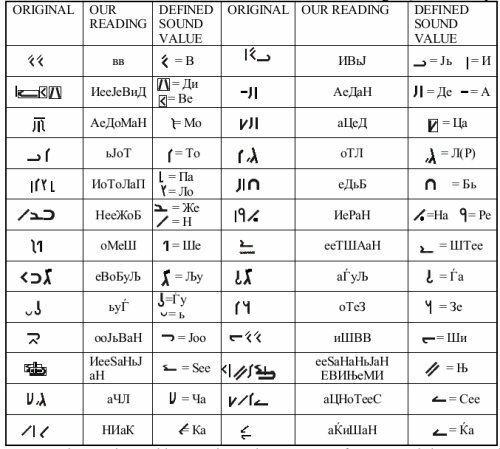 In this phase the analysis will, of course, be based on a comparison between words from the text of the Rosetta Stone and archaisms from the dialects of the contemporary Macedonian language. According to this, in the table bellow, we are presenting very basic definition words in an adequate sequence, which we were using for establishing sound values for the identified signs in our previous works, , . In the previous table, we give only an excerpt from a much larger number of definition words that we are used to obtain sound value of consonant and assignment of sound value for vowel, which is given with the rotation of initial sign form. The asymmetrical signs Ј [j], and Р [r] in today’s and in the ancient Macedonian script have the same form and the same sound. According to their written form the remaining asymmetrical signs are mutually similar, and in their pronunciation, too, for example the asymmetrical signs Ж [zh], З [z], and Ѕ [dz]. The similarity in writing and in the pronunciation also applies to the asymmetrical signs С [s], Ц [ts], Ч [tch], as well as Ш [sh], andШт [sht]. Each of these 13 consonants on the writing surface (plane) can be written using 8 dispositions and can denote syllables with 8 vowels. All 8 (eight) positions of writing are identified in the text, which means they have been wired for sound with all 6 active vowels in today’s Slavic languages and the long forms of the vowels ọ[oo] and ẹ[ee] which have been preserved in the contemporary Slovenian language [1, 2], as well as in some of the dialects of the Macedonian language (Miyatchki and Vevtchanski, ). All forms of the asymmetrical signs with their wiring for sounds are presented in the table 2. No more than 4 positions for writing were found for each of the signs wired for sound in the text. The formation of syllables in the corresponding vowels is shown in the table 3, positions 1, 2, 4, 5, 6, and 7, respectively. In order to form a syllable with the vowel и[i], we identified that the signs of the consonants В[v] and Л[l] were written with the mark for virama and then the symbol for the vowel и[i] was added. According to their written form, we would like to notify here a similarity of the form and in their pronunciation too, for the inclined signs Л[l] and Љ[lj], as well as Н[n] and Њ[nj], and,at the end,К[k] and Ќ[kj]. 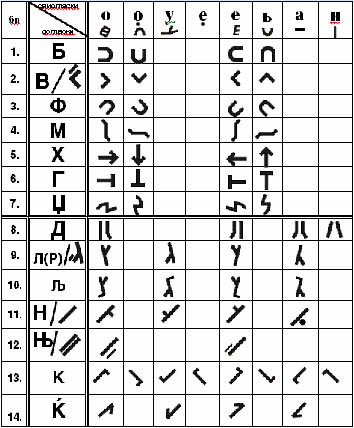 Apart from our research, the syllabic sign Ди[di] has the same form of wiring for sound in the monograph , as well as in glagolitsa, as it is presented in . The pronunciation of the isolated consonant changes into soft Р[r], sound which we have it even today in the pronunciation of words from the Macedonian language. It should be mentioned here that contemporary scholarship has concluded that it was during the Ptolemaic dynasty that a distinction was made for the first time between the sounds Л[l] andР[r], which was appropriately transferred into the script, i.e. in the analyzed text. The pronunciation of the isolated consonant в[v] most frequently occurs in the formation of the syllable with the vowel и[i], or in the formation of the preposition во [vo] (equivalent to the English prepositions in, at), in original вв [vv] - . The inclined line without addition (/ ), denotes the isolated consonant н[n], which is very frequently used in the contemporary Macedonian language. In the analyzed text, most frequently used sign is the vertical line ( | ), which was wired for sound with the vowel и[i]. Besides the use of the vowel и[i] as a conjunction, it is also used at the end of the word for formation of the plural of nouns and adjectives. We must notify here that up until now we didn’t manage to idenify the corresponding sign for the isolated vowel ee[ee]. The very frequent occurrence and the place of occurrence of the three vertical lines ||| as a single sign suggest its meaning: БОГО [Bogo]. The same sign, with the identical wiring for sound is found in , as well. We prove our conclusion by deciphering the adjective Божен [bozhen] (equivalent to English divine), written down using syllabic signs previously formerly wired for sound in form and their superlative form најбожен [naibozhen] (in English the most divine). The three inclined lines occur in a specific construction to define the term СВЕТОСТ [Svetost] (equivalent in English the Eminence), in original inscribed as (from right to left). That is equivalent to English Master Master. If for the sign we conclude the pronunciation of soft Р[r], then from the analysis of the previous examples of the three inclined lines we can definitely give the wiring for sound of ГОСПОДА[gospoda] (equivalent to English Master). Usually the ligatures were written at the beginning of the word, and the word was ended by adding 1 or 2 syllabic signs. In some cases two successive words can be connected with a ligature, which makes the process of the division of words additionally difficult in a continuously written text. Most frequently 2 to 3 signs were used in a ligature.